At Lennys our premise is that “Everybody Deserves Great Food” and our mission is simple - to make and serve great food. The first Lennys Subs opened in 1998 in a suburb of Memphis, TN, and we have been dedicated to that premise and mission since day one! We offer craft breads baked fresh daily, premium meats sliced to order, and freshly prepared toppings. This all results in truly great sandwiches that our guests crave like our “World Class Philly Cheesesteaks”, the awesome meatball sub, unique grilled sandwiches, and some of the best deli sandwiches you can find anywhere! That brings us back where we started. 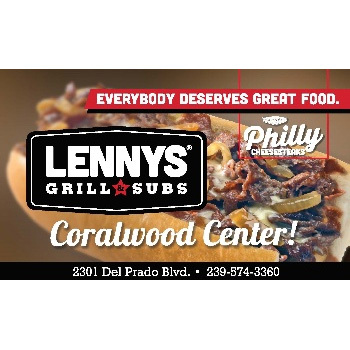 “Everybody Deserves Great Food” and we make and serve that at Lennys! Dine In or To Go.